Bestowed with all the hopes of Hell, the Green Sun Princes are the newly anointed champions of the Yozis. Already the Princes begin to come into their own, demonstrating a wide array of terrible powers, some not glimpsed in Creation since the Primordial War… and some never seen before at all. But with all the might of a stolen Solar Exaltation at their fingertips, what need have the Infernals for the Yozis and their petty desires? Will the Infernal Exalted liberate their masters from Hell, or replace them as a pantheon of new and greater titans? • Additional Charms from the five original Reclamation conspirators, as well as the corrosive magic of Kimbery, the Sea That Marched Against the Flame. • A selection of Infernal hearthstones birthed from the geomancy of Hell. • New Heretical Charms with which to slip the leash of the Yozis and enact a personal apotheosis. • A black-and-white version for easier printing. 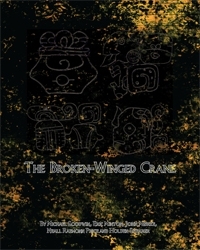 The Broken-Winged Crane is now available at RPGNow.com.